Our ever faithful guide, Ofer from Rent-a-Guide Israel, arrived early on Friday morning to embark on the long drive out to Masada & the Dead Sea. It would be a long drive, but we were seated in a comfortable van with plenty of leg room and comfort. We left the coastal area and ventured in land. Soon, the changes in landscape features became evident. The coastal oasis began to slowly transform into desert sands and Bedouin villages began to surface amongst the stark arid landscape. Ofer told us to look out for camels roaming the desert belonging to the Bedouins, but we saw none during our inward trek to Masada and the Dead Sea. After almost two hours, we began our descent towards the lowest point on earth and the scenery was magnificent. Our guide informed us that we would be visiting Masada first and then we would finish the afternoon in the Dead Sea. His planning was quite appropriate as the desert temperatures began to rise, even in late October. 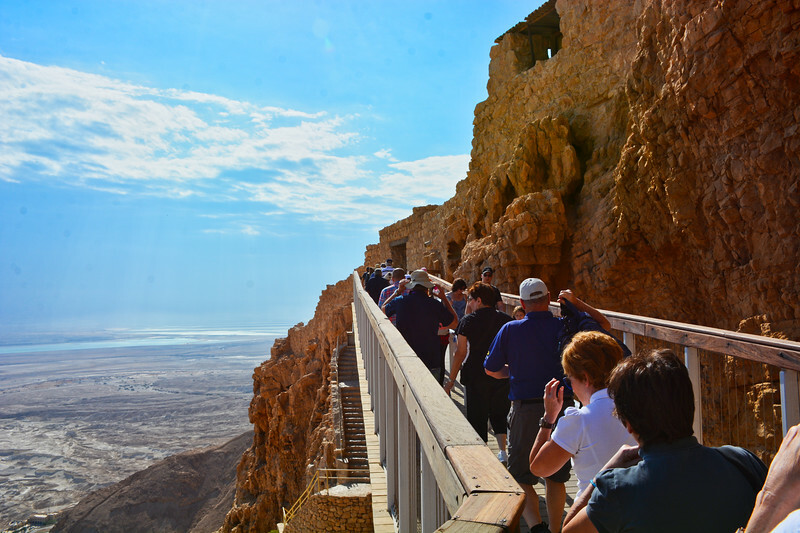 We approached Masada National Park and stared at the enormous Judaean desert mountain range in front of us. Despite the desert heat, we saw many people attempting the climb to the ancient fortification on top of the isolated rock plateau. In lieu of the climb, we opted for the very efficient cable car which would take us up the mountain to where the ancient remains of the great rugged natural fortress that was built by Herod the Great, between 37 and 31 BCE. 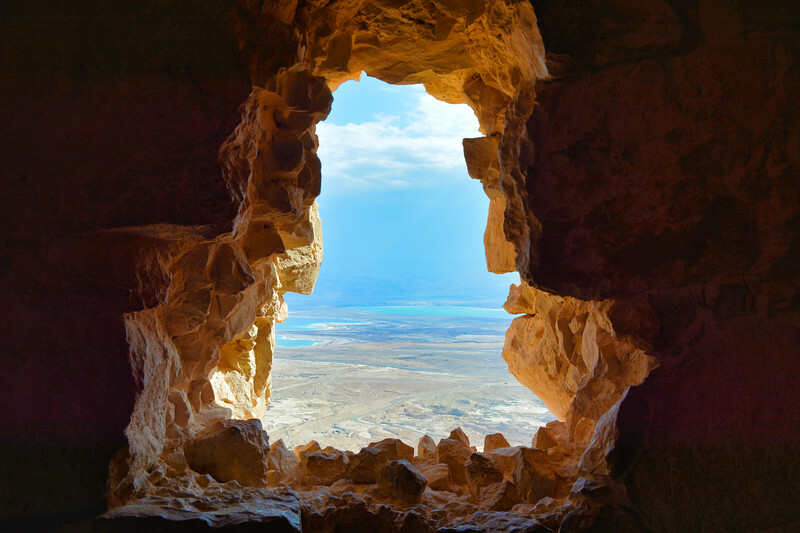 Masada truly was a fascinating archaeological site to visit and offered spectacular views of the Dead Sea. As well, we saw very interesting birds (as we are birders!) such as the Blackstart, Desert Lark, Tristram’s Starling, and Fan-tailed Raven. Observing these birds thrive in such a stark, dry environment was most interesting. Following our visit to Masada, we descended back down to the lowest point on earth and had lunch at the Petra Shopping Centre. During lunch, I was able to observe more birds that foraged amongst the park – a man-made oasis within the desert. After lunch our guide took us to a beach (Ein Gedi) that was not very busy at all. Our entire group then ventured into the Dead Sea which had such a high salinity that the water seemed like an oil slick on your skin. We were all trying to find our balance as our bodies immediately went into “float” mode. We shared many laughs as we rolled in the water that was determined to keep us afloat. There was no rush by our guide as we playfully enjoyed this remarkable inland sea. As a group, we all decided to leave the soft waters at the same time and shower off what seemed to be buckets of salt. We all couldn’t believe how soft our skin was afterwards. Imagine being able to soak in this sea on a weekly basis? any skin conditions would be gone! We boarded our van after this natural spa visit and were ready for a rest for the long drive back to Ashdod. However! our tour was not over quite yet. 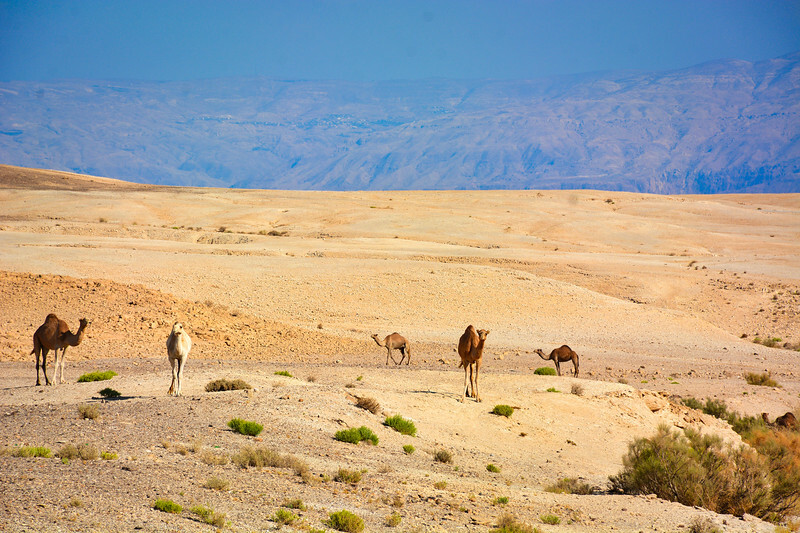 Along the way home, we spotted a large herd of camels in the desert, just as Ofer had described this past morning. We begged for him to stop for pictures, but there was no safe spot to pull the van over – and then it happened! just as Ofer was saying it was not safe to pull over, a small break in the shoulder opened up and he was able to guide the van safely off the road. He warned us to be careful and not to turn over any rocks (lest we meet up with desert scorpions or snakes!) and he cautioned us not to go far. We all climbed up a small rock hill for an incredible view of the camels that continued to increase in numbers from various points in the desert. It was a large herd, at least two dozen camels of varying shade of beige and brown. We were over the moon with this spectacular sighting and the opportunity to take breathtaking memorable photos. An incredible finale to a wonderful day! after our camel experience, we drove home through a Thunderstorm and arrived back at the ship in good time to clean up and have a lovely dinner in Luminae. This was the end of our stay in Israel. Three glorious days in an amazing country. We now felt as if we had “traveled”.